Originally trained as a painter, he began studying the chemistry and techniques of glassmaking when he was 24. He developed this interest as a partner in the firm of Louis C. Tiffany and Company, Associated Artists (1881–83) provided innovative interior decoration for clients ranging from Mark Twain in Hartford, Connecticut to President Chester Arthur at the White House. In 1885, Tiffany established his own firm and while he continued to undertake decorating commissions, his focus was on new methods of glass manufacture. Four years earlier he registered a patent for opalescent window glass, a radical new treatment whereby several colors were combined and manipulated to create an unprecedented range of hues and three-dimensional effects. Tiffany believed that this new material allowed more fidelity to the inherent nature of the medium, because it enabled form to be defined by the glass itself rather than by painting onto the glass. Opalescent glass, however, was firmly rejected by the other important school of the stained glass revival, which advocated the Gothic tradition of painting with enamel on clear, uniformly colored “antique” glass. 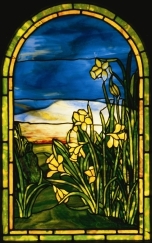 The passionate moral dimension of late 19th-century taste is clearly seen in Boston glassmaker Charles Connick’s declaration that his firm’s greatest contribution to stained glass was “rescuing it from the abysmal depth of opalescent picture windows.” Those, like Connick, who followed the medieval precedent of painting on clear glass, were in bitter opposition to Tiffany and to John La Farge, the artist who had developed opalescent glass about the same time as Tiffany, and was his chief competitor. Both schools thought that they alone were being "truthful," an ideal central to the philosophy of the Arts and Crafts movement. Equally important was the goal of design unity. First manifested in his efforts to create complete interiors, Tiffany’s commitment to unity was extended to the design and manufacture of stained glass. The leading necessary to hold the pieces of glass together became a fully integrated design element, simulating, for example, the stems of plants. Tiffany was convinced the actual production of a stained-glass window required the artist’s involvement at every stage, even in a factory setting—from creating the first sketches to overseeing how the glass was selected, cut, and assembled. Tiffany’s aesthetic was based on his conviction that nature should be the primary source of design inspiration. Intoxicated by color, he translated into glass the lush palette found in flowers and plants. This fascination with nature and with extending the capabilities of the medium led to the exploration of another technique—in 1893 Tiffany introduced his first blown-glass vases and bowls, called “Favrile.” The name, he declared, was taken from an old English word for hand made. Favrile glass quickly gained international renown for its surface iridescence and brilliant colors. Tiffany was among the first American designers to be acclaimed abroad. Favrile glass, together with stained-glass windows such as the Four Seasons, was shown at world’s fairs and sold in galleries like Siegfried Bing’s L’Art Nouveau, which served as a conduit for the most innovative design at the turn of the century. In the United States, Tiffany continued to execute special commissions for stained glass and glass mosaics. Much of this work was for churches, whose patronage Tiffany often put at risk because of his strong preference for landscapes instead of traditional religious figural scenes. He also expanded his more commercial activities and established a metalwork department, producing lamps, desk sets, and chandeliers that were sold in the thousands through his own New York showroom, company catalogues and department stores. More personalized expressions continued as well: In 1898 Tiffany began experimenting with enamels, in 1900 with a line of pottery, and by 1904 with designs for jewelry. While glass is the most significant medium in which Tiffany worked, he designed, fabricated, or sold everything that made up an interior, including furniture, textiles, and wall coverings. A desire to create a unified artistic expression culminated in the last house he designed in its entirety—his own. Laurelton Hall, in Cold Spring Harbor, Long Island, was completed in 1904. The Morse Museum is the greatest repository of Tiffany furniture, stained glass, mosaic work, and architectural elements from this masterpiece. 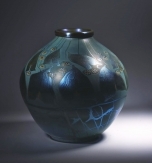 Tiffany’s work reflects the efforts to resolve the conflicting ideals of the Arts and Crafts movement. William Morris, its English protagonist, had demanded: "What business have we with art at all unless all can share it?" Yet most companies could not produce affordable art for the home while retaining high standards and individual expression. Tiffany, however, successfully created an art industry. He triumphed where others had failed because his personal fortune allowed him to sacrifice company profits in the interests of artistic achievement. In addition, he provided an extraordinary range of products, so that consumers at almost every economic level had access to his religion of beauty. The visitor to the Morse Museum is invited to examine what a critic in 1900 called Tiffany’s “dumbfounding versatility”—from the lamps that were made in the thousands to the unique windows executed for special commissions or for the artist’s own use.